Tikal (or Tik’al, according to modern orthography) is the largest of the ancient ruined cities of the Maya civilization. It lies in modern day Guatemala at . Now it is a UNESCO World Heritage Site, and a popular tourist spot. Tikal was one of the major cultural and population centers of the Maya civilization. The oldest monumental architecture at the site dates to the 4th century BC. The best time of Tikal was during the Classic Period, from 200 AD to 900 AD. In this period, Tikal was in charge of the Maya region politically, economically, and militarily. This is because it was linked with areas throughout Mesoamerica, such as central Mexican, the center of Teotihuacan. After the end of the Late Classic Period, no new major monuments were built. Some palaces were burned and the population declined. The site was abandoned by the end of the 10th century. The ruins are on lowland rainforest, but Tikal had no water other than what was collected from rainwater and stored underground. Archaeologists working in Tikal during the last century used the underground facilities to store water for their own use. The absence of springs, rivers, and lakes nearby is unusual for a major city. However, Tikal did well with intensive agricultural techniques. These were more advanced than the slash & burn methods originally theorized by archeologists. The reliance on seasonal rainfall made Tikal open to drought. This is now thought to play a major part in the Classic Maya Collapse. King of Tikal from wooden lintel in Temple III. Depicting either "Yax Nuun Ayin II" or "Dark Sun"
Chak Tok Ich'aak I ("Jaguar Paw I") – c.a. 360-378. His palace, unusually, was never built over by later rulers, and was kept in repair for centuries as an apparent revered monument. He died on the same day that Siyah K'ak' arrived in Tikal, probably executed by the Teotihuacano conquerors. Nun Yax Ayin – A.D. 370-411. 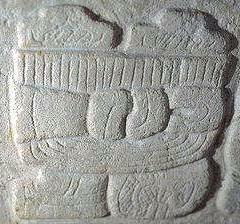 Nun Yax Ayin was a noble from Teotihuacan who was installed on Tikal's throne in 379 by Siyaj K'ak'. Siyaj Chan K'awiil II ("Stormy Sky II") – A.D. 411-456. K'an-Ak ("Kan Boar") – A.D. 458-486. Ma'Kin-na Chan – ca. late 5th century. Chak Tok Ich'aak (Bahlum Paw Skull) – A.D. 486-508. Married to "Lady Hand"
Ix Kalo'mte' Ix Yo K'in ("Lady of Tikal") – A.D. 511-527. Co-ruled with Kaloomte' B'alam, possibly as consort. Kaloomte' B'alam ("Curl-Head" and "19th Lord") – A.D. 511-527. Co-ruled with Ix Kalo'mte' Ix Yo K'in ("Lady of Tikal"), as regent. "Bird Claw" ("Animal Skull I", "Ete I") – ca. A.D. 527–537. Wak Chan K'awiil ("Double-Bird") – A.D. 537-562. Capture and possible sacrifice by Caracol. "Lizard Head II" – Unknown, lost a battle with Caracol in A.D. 562. 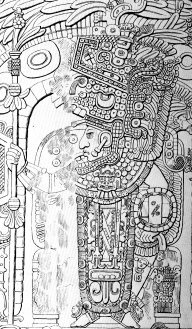 K'inich Waaw – A.D. 593-628. K'inich Wayaan – ca. early/mid 7th century. K'inich Muwaan Jol II – ca. early/mid 7th century. Jasaw Chan K'awiil I (a.k.a. Ruler A or Ah Cacao) – A.D. 682-734. Entombed in Temple I. His queen Lady Twelve Macaw (died A.D. 704) is entombed in Temple II. Triumphed in war with Calakmul in A.D. 711. Yik'in Chan K'awiil (a.k.a. Ruler B) – A.D. 734-766. His wife was Shana'Kin Yaxchel Pacal "Green Jay on the Wall" of Lakamha. It is unknown exactly where is tomb lies, but strong archaeological parallels between Burial 116 (the resting place of his father) and Burial 196, located in the diminutive pyramid immediately south of Temple II and referred to as Str. 5D-73, suggest the latter may be the tomb of Yik’in Chan Kawil (Sharer 1994:169). 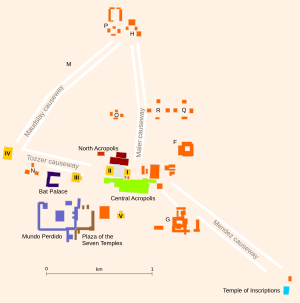 Other possible locations, and likely candidates as mortuary shrines, include Temples IV and VI. Map of the Maya area within the Mesoamerican region. Both Tikal and Calakmul lie near the center of the area. The great metropolis of Teotihuacan in the Valley of Mexico appears to have decisively intervened in Tikal politics. Detail of Teotihuacan-related imagery decorating the sloping talud sections of the talud-tablero sides of Structure 5D-43. The elaborately carved wooden Lintel 3 from Temple IV. It celebrates a military victory by Yik'in Chan K'awiil in 743. A ceramic censer representing an elderly deity, found in Burial 10. Tikal Facts for Kids. Kiddle Encyclopedia.